The final mission of Brood War. Take command of one of three fleets and destroy Kerrigan's swarms. Post has been edited 26 time(s), last time on Jan 12 2019, 6:27 am by Pr0nogo. As of right now Omega is not final and will continue to be updated, but I figure it functions well enough to open it up to the general public. Looking for suggestions re: making the AI perform better and the players enjoy the map more. ✓Buff Dominion units - DONE as of 15/1/18 (see below). ✓Buff heroes - DONE as of 15/1/18. 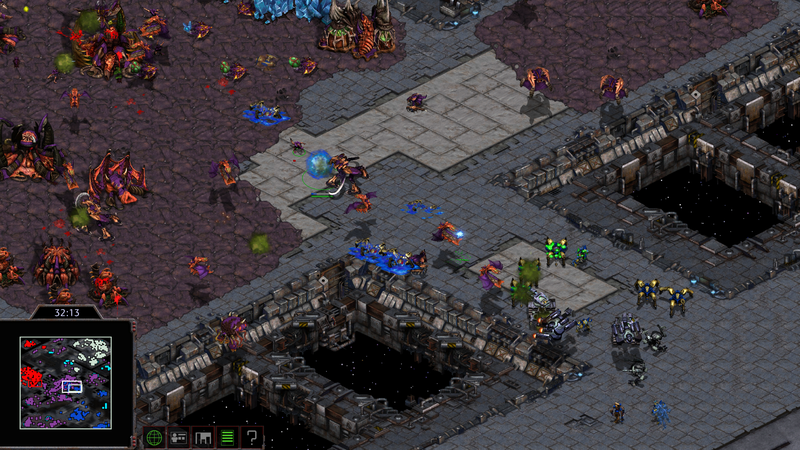 -Most zerg units cost half supply. 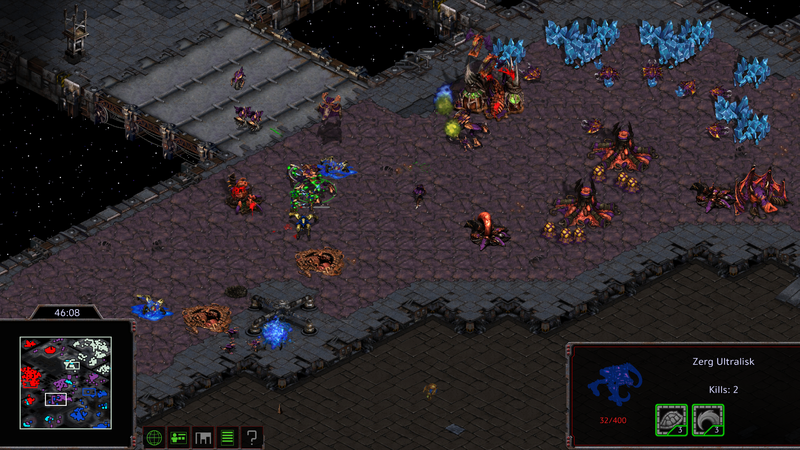 Drones/zerglings/scourge cost none. Overlords provide 10 instead of 8 and move much faster. -AI expands up to 7 9 times if left unchecked. -Some zerg spells have reduced energy costs to encourage more spellcasting. 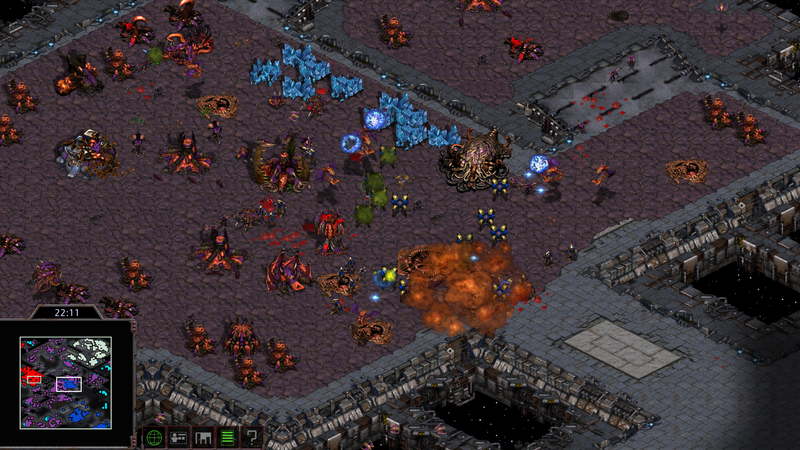 -Dominion and zerg can build nukes, UED cannot. -Mengsk and DuGalle have been given custom soundsets and all heroes have buffed weapons/upgrade bonuses. Arcturus Mengsk's flagship. 1000 hp. 4 armor. Attacks ground and air units with 18 +3 ignore-armor damage in a large AoE. Can cast Yamato Gun. Gerard DuGalle's valkyrie. 500 hp. 4 armor. Attacks ground units with 60 +10 explosive damage in a large AoE. Attacks air units with 9+2 explosive damage per missile in a large AoE. Can cloak. 300 hp. 400 shields. 3 armor. Attacks ground and air units with 60 +10 explosive damage in a small AoE. Costs 75/25. +25 hp, +1 armor. Attacks ignore armor. Can use Stim Pack. Costs 100/100. +40 hp, +1 armor. Mid-range explosive missile attack. Can cast Feedback. Cost 75/25. +1 armor. Can attack air units. Deals normal damage. Costs 200/100. +1 armor. Can attack air units in tank mode. Explosive missile attack. Siege mode deals wide AoE with bonus range. Air attacks deal splash damage. Costs 175/125. +40 hp, +2 armor. Mid-range explosive missile attack. Cannot cloak. Can cast Restoration. Cannot cast EMP Shockwave. Irradiate deals bonus damage. Attacks significantly faster with reduced damage (overall boost to DPS). +20 hp. +2 damage. Attacks deal normal damage. Can cast Lockdown on organic targets. Costs 50/100. -5 hp. +1 armor. Permanently cloaked. AoE normal laser attack. Attacks ground units. Costs 100/75. +1 armor. Attacks ground units with a flamethrower at close range, otherwise uses standard attack. Costs 150/75. Trains faster. +1 armor. Attacks ground units faster. -100 hp. +1 armor. Mid-range normal rocket attack. Can cast Yamato Gun. +20 hp. +20 shields. Short-range concussive instant attack. Can attack air units. Can cast Maelstrom and Mind Control at reduced energy costs. +40 hp. +60 shields. +4 transport space. Moves faster. +2 required transport space. Costs 225/125. Trains faster. +1 armor. Moves faster. Cannot receive sight range or movespeed upgrades. Can cast Disruption Web. Trains faster. +1 armor. Short-range normal hitscan attack in a small AoE. Uses Corsair graphic. Costs 150/250. Trains faster. +1 armor. Can cast Recall and Stasis Field at reduced energy costs. Attacks faster. Deals increased normal damage. 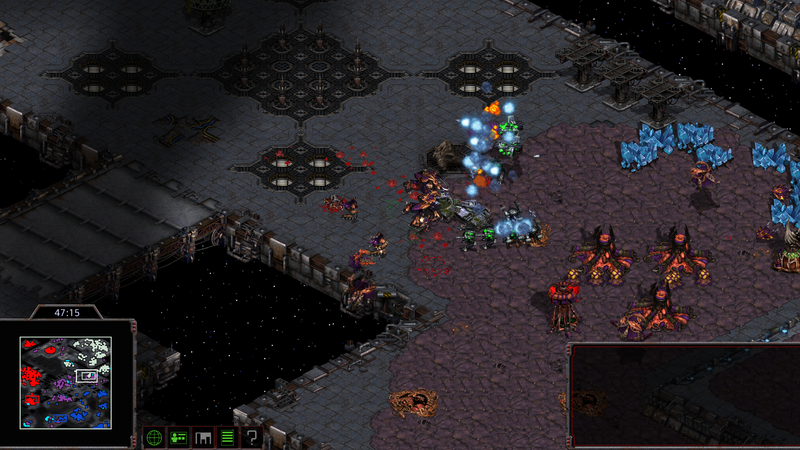 Benefit from zerg carapace upgrades. Benefits from melee attack upgrades. +3 damage per upgrade. Benefits from missile attack upgrades. +3 damage per upgrade. Attacks deal damage in a small AoE. Reduced burrow animation length by 1/3rd. Benefits from flyer attack upgrades. +3 damage per upgrade. Benefits from melee attack upgrades. +15 damage per upgrade. Attacks ground units with 30 +2 explosive damage. Attacks air units with 20 +2 explosive damage in a small AoE. 120 hp. 90 shields. 1 armor. Costs 150/100. Attacks ground units with 15 +3 normal damage. Can cast Hallucination. Uses infested kerrigan graphic. 80 hp. 60 shields. 1 armor. Costs 100/300. Attacks ground and air units with 20 +2 concussive damage. Can cast Mind Control. Uses high templar graphic. Benefits from zerg carapace. Otherwise identical to default reavers. 125 hp. 1 armor. Costs 100/125. Attacks ground and air units with 25 +3 normal damage. Can cast Lockdown. Can use nukes. 25 hp. 2 armor. Permanently cloaked. Otherwise identical to default scourge. 130 hp. 2 armor. Costs 100/300. Airborne. Attacks ground and air units with 15 +2 concussive damage in a medium AoE. Can cast Psionic Storm and Feedback. Uses defiler graphic. +1 armor to all buildings. Max 2 levels. Available for all human players. Costs 200/200 at level 1, 300/300 at level 2. Purchased at the engineering bay/forge. Increases protoss shield regen to 1.5x speed at level 1, and 2x speed at level 2. Available for protoss and zerg. Costs 200/200 at level 1, 300/300 at level 2. Purchased at the citadel of adun. Sets life regen to 1 hp per second for the marine, immolator, and spectre. Available for Dominion. Costs 200/200. Purchased at the Academy. Increases energy regen by 1 energy per second for the medic, science vessel, ghost, and dreadnought. Available for UED. Costs 200/200. Purchased at the Science Facility. Increases larva spawn rate to 5 seconds. Available for zerg. Costs 200/200. Purchased at the hive. Post has been edited 6 time(s), last time on Apr 12 2018, 3:43 am by Pr0nogo. Omega has been updated with a fix that hopefully makes the AI more prone to expanding (needs more testing). All heroes have also been buffed with new/modified weapons. Thanks to Excalibur for standardizing the resource areas - should make everything a bit more palatable, even if it looks significantly worse aesthetically. Next step is probably the new Dominion units and making the AI attack with more variance (its loops are pretty static atm). Post has been edited 1 time(s), last time on Jan 16 2018, 1:56 am by Pr0nogo. Open to further suggestions re: balancing and new stuff for the players. Special thanks to Excalibur for donating his thoughts and terrain work, and to all the testers that helped out. Post has been edited 1 time(s), last time on Jan 16 2018, 12:26 pm by Pr0nogo. Various tweaks to the players' new tech are in and building armor is now on the engineering bay and forge. -Now build Spectres instead of Ghosts; explosive damage, can cast Feedback. -Now build Scythes instead of Vultures; normal aoe damage, permacloaked. -Now build Purifiers instead of Goliaths; same as normal but with an added flamethrower for close range targets. -Can now cast Disruption Web from Scouts. -Can no longer build Corsairs. -Cycles through various defense profiles. Will definitely need tweaking to ensure performance isn't hit too hard. -No longer sends attacks to players that have lost the majority of their base. Resets after all players have lost the majority of their base and checks again for any would-be roaches. 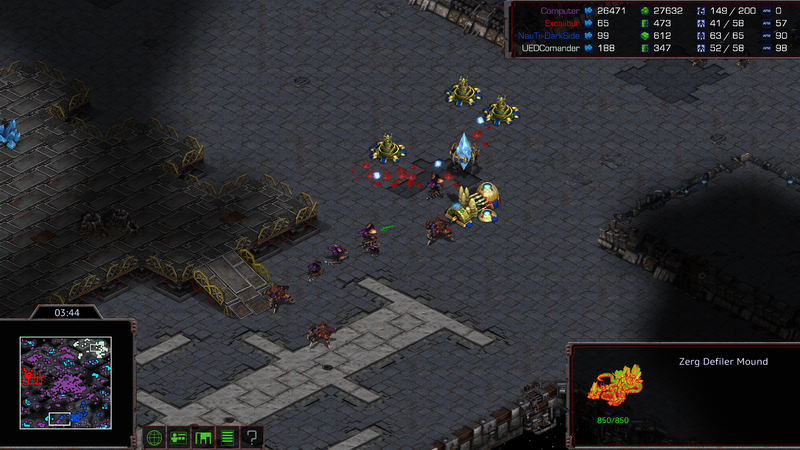 -Has enhanced targeting for dark swarm. -Researches plasma shields for infested zealots. -Takes back mind controlled torrasques after a few minutes. -Has frailer queens (120 -> 90 hp) but casts spawn broodling more frequently. -Attacks slower in the early game, faster in the late game, and with a generally more dynamic army composition. Post has been edited 4 time(s), last time on Jan 18 2018, 11:50 am by Pr0nogo. -Increased supply cap to 300. -Added a 4th infested command center. -Added detection to all player heroes. -Fixed resource layout in Dominion main. -Plague and Ensnare last a shorter amount of time. 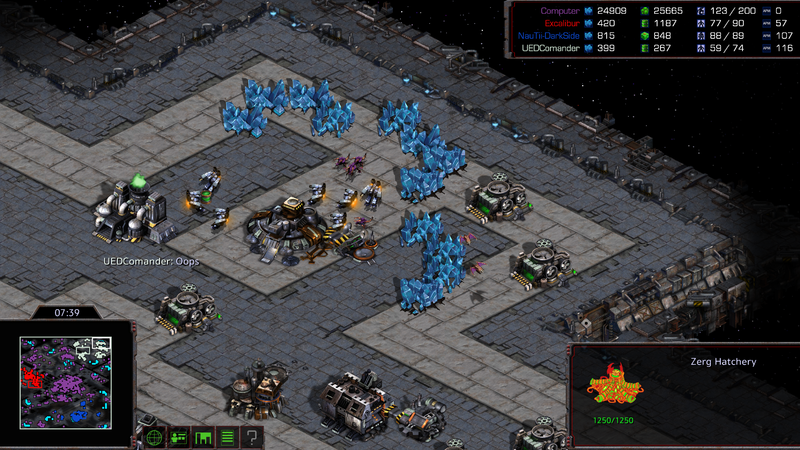 -Added 500-2000 gas per geyser depending on their proximity to the zerg. -Vultures may now attack air targets. -Goliath air attack now does splash damage. -Phoenix attack now deals increased damage. -Scythes may no longer attack air targets. 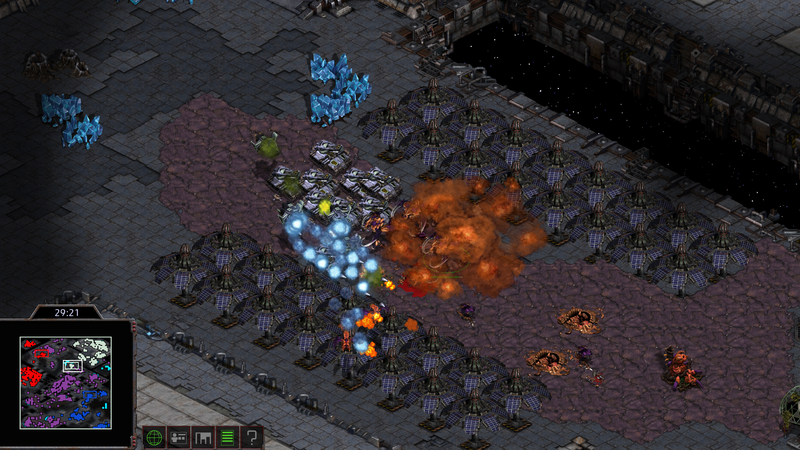 -Purifiers have a slightly smaller area of effect for their flamethrower attack. -Fixed Ghost Lockdown targeting on organic units. -Lowered cost of Mind Control to 125 energy. -Now train Infested Templars from Infested Command Centers; can cast Mind Control and will do so primarily on enemy zerg units. -Now train Psikolisks from larva; flying heroic Defilers that can cast Psionic Storm and Feedback. -Now use Spawn Broodling less frequently on SCVs. -Infested Zealots can now cast Hallucination. -Now take longer to reach maximum strength. Post has been edited 2 time(s), last time on Jan 20 2018, 1:43 am by Pr0nogo. I have reworked a significant amount of the AI script and mod. To preserve the latest version, it has been separated from this new, experimental commit. You can find links to both in the OP. The old URL will remain valid for finding the latest version. Additionally, I have been silently updating the MEGA link several times, which could easily lead to version mismatches and unnecessary confusion. From now own, pre-release versions will be placed in the 'Pre-release' folder in the main directory, and the main package will remain unedited until I post new patch notes. Lastly, I plan on archiving release versions from now on, in case I need something in an older version. -Removed most AI guards, replacing some with a separate computer player's. The new player does not have an active script and will not restock the guards. 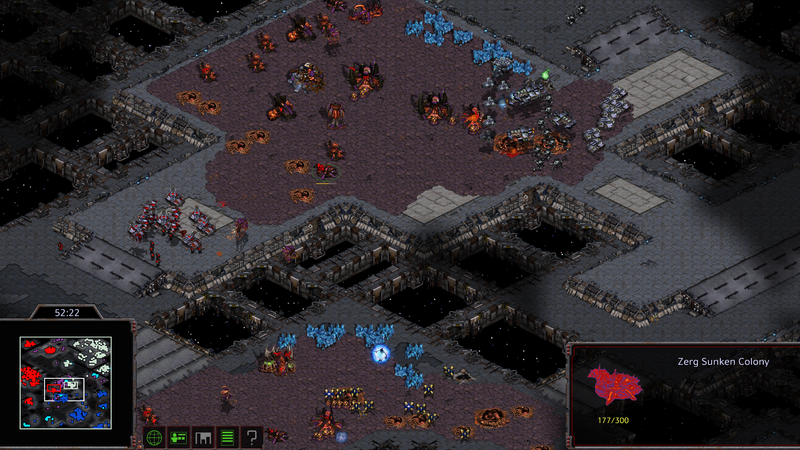 -Removed most of the AI's starting base, keeping some static defense for creep and anti-cheese. The AI will now build up its tech from a humble beginning. -Relocated the Infested Command Centers and added two total. The outlying ICCs will arm Nuclear Silos as time goes on, and the AI will use them to nuke (hopefully). 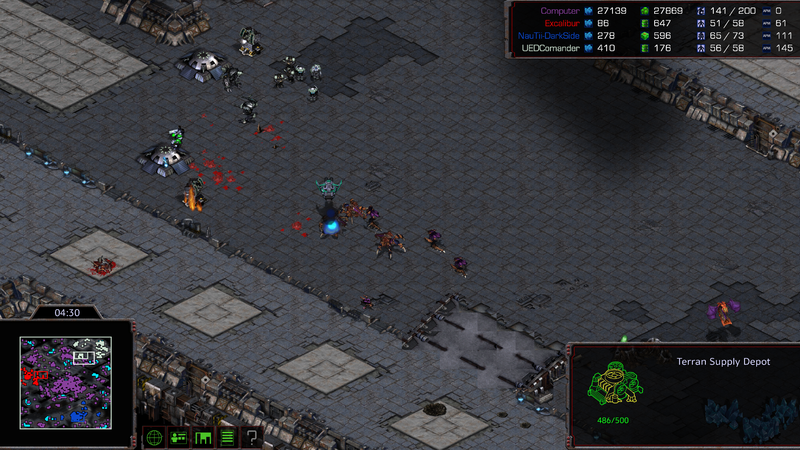 -Added the framework for two new infested units. -Added an extra proxy position for the AI. -The AI will no longer target the same player with back-to-back large attacks. Harassment attacks will select as per usual. -Added a few additional prepare and target zones for the AI. -Their Comsat Station now scans a nearby expansion at game start. -Made a drop zone unbuildable to prevent the AI from "defending" the Dominion base. -They now start with an Observer overlooking a nearby expansion. -Added an extra Pylon and rearranged a few base structures. -They now start with a Marine guarding a nearby expansion. Pushed a new patch that regulates AI defense more tightly, governs all spellcasting much more explicitly, and hopefully fixes some minor issues with AI town management. Patched to a new version that takes care of some balance issues re: Infested Zealot and UED Scythe. Unclogged the request log for the better portion of the early game, reinstated Queens, and added a lot of code that should make the AI soft counter binary comps depending on what the players build, though it hasn't been debugged yet. Max AI expansions down from 12 to 9, and cleaned up the proxy Hatchery code. 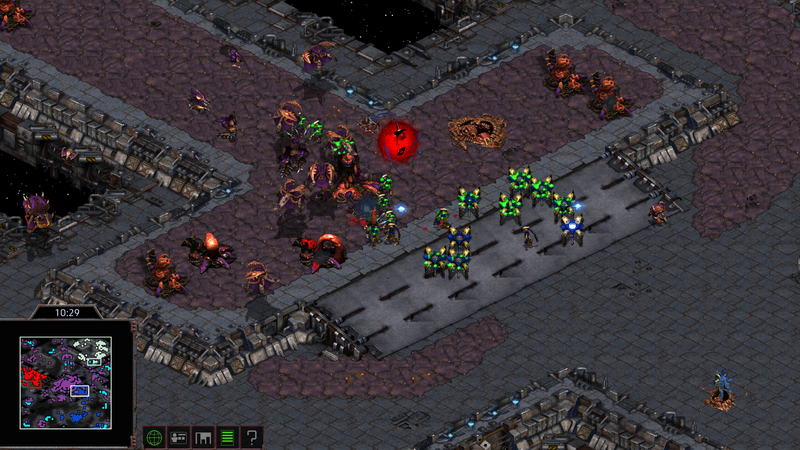 Once the AI is in a satisfactory state I will see about implementing the boss battle idea I have in mind for Kerrigan. This would also shorten the macro portion somewhat significantly as the only requirement for activating it would be to destroy Kerrigan's Hive, so I'll have to keep that in mind going forward. Thanks to everyone who has tested and chimed in with feedback! The script has been rewritten from scratch and now uses updated defense/attack systems that will prevent it from ever receiving a request it can't satisfy. I will eventually replace train and place_guard commands with this tech as well. Currently the script is unfinished, with the main thread's attacks looping after 20 minutes. I'll finish it once I verify that the AI functions as intended. The AI is likely overtuned but I'd appreciate feedback/videos/etc if anyone has the time to give the update a run. I've also added new upgrades courtesy of Neiv's recent update to the mtl plugin. Shield regen for protoss units, life regen for Dominion infantry, and energy regen for UED spellcasters are among the changes. Post has been edited 2 time(s), last time on Apr 12 2018, 3:34 am by Pr0nogo. This looks amazing. I'll have to give it a whirl when it's released. You seem to be pretty damn inspired by co-op melee maps lately. This seems similar to Hydra, is it not? This actually predates hydra by release date and is available for download (has been since January of this year). The concept of fighting against AI alongside other players in a campaign setting certainly matches up with hydra, but has some key differences from the project. Although the mod changes are extensive, the big calling card of Nemesis Omega is the massive AI script that comprises nearly 5000 lines and is only going to get bigger as time goes on. After rewriting the entire script from scratch, it is closer than ever to 100% stability, and can easily give three average human players a run for their money. The techniques I've developed during this mod's dev-time have been extremely influential and I will likely benefit from them for years to come. 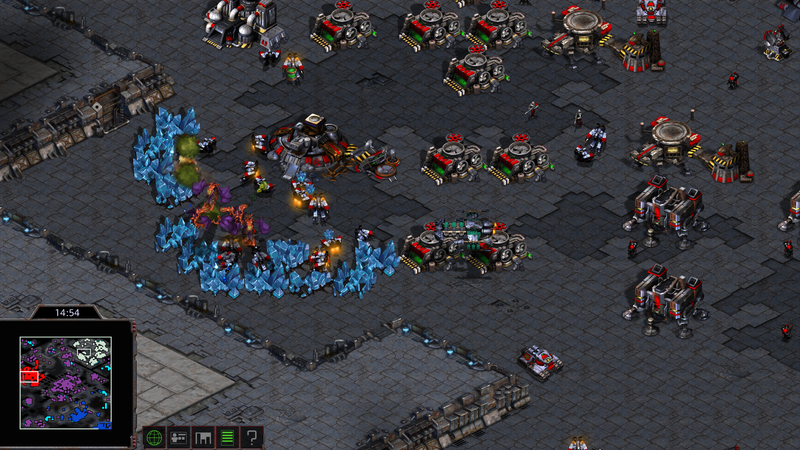 This mod serves as my single most exhaustive attempt at modding SC:R and I view it ultimately as a failure due to the crippling limitations of post-1.16.1 versions of brood war. After this mod's completion I will no longer seek to develop remastered projects and will exclusively remain with 1.16.1. That being said, I'm open to making additional changes leading up to the conclusion of the project, so if you have suggestions please make them known. How'd you do the energy, shield, and hp regen? Neiv's latest changes to his mtl plugin allow for a bunch of rudimentary upgrades to be created for the game. Also supports changing max supply, ability timers (e.g. reducing duration of plague), etc. As far as I know he hasn't posted it anywhere publicly, so you'll have to ask him or join my discord server if you want access. And this is all modding? Very nice. Where can I find the link to your Discord server? Made some stability fixes as the latest patch changed some stuff around. Some people on my discord server have been looking to get a game of this going, so jump onboard if you're interested.